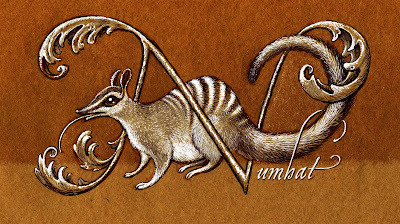 This week's entry for Ben Towle's Animal Alphabet is the numbat. Thanks to Isaac Cates for suggesting this odd & elegant marsupial! Sketched in ball-point pen, marker & white gouache on brown paper, then a bit of Photoshop fiddling. I think the marsupial fanciers of the world can be glad that you took on the numbat, and glad too that it was you instead of me. That's an awesome, cute, awesomely cute drawing. I continue to be impressed with the care and technique of your Animal Alphabet pieces. Here's to the patriotic numbat. A beautiful intertwined illustration with a great choice of colour palette. That's beautiful! I like the shiny eye, and the fur. somehow I missed these last couple of posts...they're GREAT! Wow! !